Do You Have the Tools to Make Your Remote Workers Feel Connected? Businesses invest the most capital in two things: their real estate and their people. This means that physical office spaces and hiring/onboarding practices are not only top priorities, but their largest fixed costs, as well. Yet as the standard workplace shifts to a more flexible model, companies are beginning to change the way they view and address both. How? By embracing remote work policies and downsizing their physical spaces – even going as far as ditching the formal headquarters – some companies are signaling an openness to modern concepts that can change the way business is run and how work gets done. As the workforce changes, recruiting and retaining the right talent are only getting increasingly complicated. In response, companies need to get creative about how they attract and support their employees. Because, let’s face it, hiring new talent is expensive and time consuming. According to a Fast Company article, in 2011 companies spent $45 billion on recruiting, yet 46% of new hires still left the organization after their first year – 33% didn’t make it six months. And, according to a Global Workplace Analytics study, losing a valued employee can cost an employer $10,000 to $30,000. Knowing that employees who feel connected to their co-workers and the company itself are less likely to switch jobs – increasing the organization’s retention rate and lowering costs needed to support heavy turnover – companies need to take a good look at the tools and practices that support employee connectivity, so that workers’ needs are still at the forefront despite nontraditional work spaces and policies. Taking steps to support new realities for the future of work requires not only a paradigm shift but new resources. Human resource executives must develop a culture of streamlined communications; one that eliminates friction between employees, allowing them to feel connected, empowered and aligned with their teams and the company as a whole even when they aren’t together in the office. At the same time, companies that invest in the right technology will be best equipped to connect and engage with employees regardless of where and how they collaborate. The distributed workforce is becoming more and more appealing from both a financial and operational standpoint. Giving employees the ability to telecommute (even half of the time) can save a company $11,000 per person per year. Additionally, 95% of employees say telework has a high impact on their job satisfaction, and over two-thirds of employers in a recent survey actually reported increased productivity among telecommuters. Organizations need to adapt to this trend for both the success of the organization and to attract and retain top talent. To make day-to-day work run more smoothly regardless of where workers are “punching in,” it’s important that employees are able to seamlessly transition from one communication method to another. A chat tool may be the best fit for quick questions or thoughts, while video conferencing is more suitable for conversations that will benefit from face-to-face communication. Real-time interaction that emulates in-office behaviors and collaboration, makes remote work more feasible and productive. This is best done in an application that offers voice, video and chat altogether, so the transition between communication modes is realistic and regularly used. Over 40% of employers are reportedly feeling the “labor pinch” as baby boomers retire, creating a need to reduce geographic limitations when hiring. This is especially true when it comes to the younger workforce (ages 20-29) which has the highest migration rate of any group, according to the U.S. Census Bureau. HR professionals are realizing that sometimes the best talent isn’t located where they are, and are starting to hire people where they live – and offering remote work as an option. As a result of a shifting home base for key employees and customers alike, companies are investing in real estate to support and retain the mobile employee. Employers need to be sensitive to the fact that despite the new freedom to hire across expansive geographic locations, in-person face time is still important to establish rapport between teammates, maintain employee morale and develop a strong workplace community. Given that a high percentage of communication is non-verbal, companies need to invest in technology tools to extend opportunities to bring the “office water cooler” to distributed workers. Face-to-face interactions on a regular basis should still be encouraged, if not the norm. 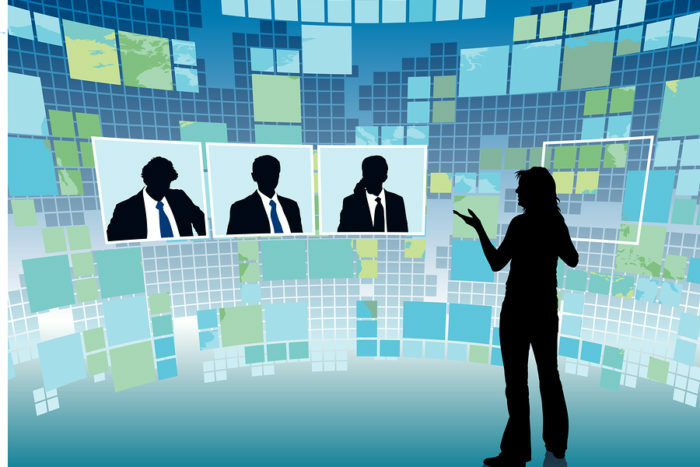 Video conference technology – with widespread adoption – enables remote employees to easily connect face-to-face, supporting impromptu brainstorms and more productive meetings. HR professionals must be a key advocate for technology adoption, working closely with IT, so that employees make use of tools for daily interactions, rather than sporadic usage, to make coworkers feel closer than ever. Above all, companies need to make it easy for people to work remotely, providing mobile employees with technology tools that are up to par with what they use in their personal lives and that are truly centered around their specific needs. Flexible, easy-to-use technology will eliminate the need for quick fixes when it comes to everyday communication, which may result in Shadow IT nightmares for your company. As the modern workplace rapidly changes, a flexible environment is becoming a “must have” for prospective employees looking for work-life balance. It’s imperative that HR professionals embrace this trend by providing the technology support needed to make it work for the employee and the businesses as a whole. The right technology will make sure your employees are connected to each other and their work, leading to greater job satisfaction. In turn, happier, more satisfied employees lead to better retention – a signal that you’ve made the right investments for the health of your business, overall. Nell Thayer Heisner is the director of talent acquisition at Fuze, a global, cloud-based unified communications platform based in Cambridge, MA. In her 20+ years of experience she has successfully partnered with senior management to build and lead recruitment teams who attract, hire, and retain the best employees in some of Boston's fastest growing tech firms. Throughout her career, Nell has worked in both agency settings and corporate settings, always with an emphasis on high growth technology and SaaS companies.